Hanson, George Calvin age 87, of Minneapolis, died on November 5, 2017. Cal was born in Paynesville, Minnesota to Florence (Payne) and George Hanson on February 18, 1930. He graduated from Redwood Falls High School in 1948, where he was a scholar, athlete, president of his class, and an Eagle Scout. 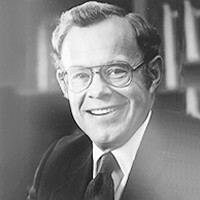 He attended Hamline University for his freshman year of college, then transferred to the University of Minnesota, where he was president of his senior class (1952), and a member and president of Alpha Delta Phi fraternity. He served as a legal officer in the U.S. Navy from 1952-1956, including active duty during the Korean War aboard the USS Essex and the USS Shangri La. He returned to the University of Minnesota and received his law degree in 1958. He practiced law in Minneapolis before entering Yale Divinity School, from which he graduated in 1969. During his ministry, he served at King Street United Church of Christ in Danbury, CT, and Hennepin Avenue United Methodist Church and Trinity United Methodist Church, both in Minneapolis. Cal married Nancy Pearson in 1954, and together they raised three children: Tim (Joan), Mark (Elena), and Karen (Andrew) Riebel. In addition to his wife and children, he is survived by his sister, Jean Hanson of Sedona, AZ; six adored grandchildren: Michael Hanson, Kathryn (Paul) Fling, Nathaniel Hanson, Olivia Hanson, Roxanne Riebel and Calvin Riebel; cousin, Barbara (Roger) Bengtson; brother-in-law, John Pearson; and niece, Amy (Dod) Clapp. Cal will be remembered for his kindness and selflessness. He was an involved father and grandfather, a beloved coach and scout leader, and was always the most enthusiastic fan in the stands. He was also a loyal friend who kept many close relationships from his childhood, college, law school and navy years, and from his church communities. He officiated at the weddings of all three of his children and baptized all six of his grandchildren. He also performed the weddings, baptisms and funerals for countless friends and family members. Always active athletically, he enjoyed downhill skiing, tennis and waterskiing at Lake Koronis well into his 70s. Funeral Service Saturday, November 11 at 3 P. M. at Hennepin Avenue United Methodist Church, 511 Groveland Avenue, Minneapolis. Visitation one hour before and reception immediately following. Memorials preferred to Hennepin Avenue United Methodist Church, Groveland Food Shelf, or take some kids out for ice cream just as Cal liked to do.